The use of repeat photography in geomorphology has become a well-established technique for illustrating landscape changes. Its use has, however, largely been restricted to relatively ‘natural’ landscapes in large parks in the American west such as Grand Canyon, Yellowstone, and Glacier National Parks. 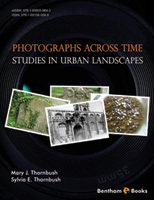 In this volume, authors Mary J. Thornbush and Sylvia E. Thornbush apply the techniques of what they refer to as ‘photogeomorphology’ to the very different landscapes of urban portions of England and Scotland. In this well-illustrated and fascinating volume, the authors use the techniques of photogeomorphology to document changes to historic structures in Oxford, England, and to urban churchyards in England and Scotland via detailed photo-documentation of changes to headstones/ gravestones. Bringing to bear their expertise in applied geomorphology (M. J. Thornbush) and urban archaeology (S. E. Thornbush), the authors illustrate how ‘archaeogeomorphology’ provides a more thorough understanding of the physical and cultural landscape than traditional observations. They do so through the use of quantitative studies of urban heritage sites as well as qualitative studies of the historical archaeology of urban churchyards. Together, the techniques and expertise on display in this book make a compelling argument for the desirability of broader applications of photogeomorphology in other locations around the world. I congratulate the authors on the spirit of enquiry on display in this book, and strongly commend it to readers across the fields of geomorphology, physical geography, landscape and heritage studies, and urban archaeology. This eBook aims to apply a photogeomorphological approach to landscape studies for central Oxford and urban churchyards in England and Scotland. It embraces an integrated multidisciplinary approach in complementary fields within applied geomorphology (photogeomorphology and landscape studies) and historical archaeology in urban settings. Its scope comprises the use of digital photographs to capture and convey cross-temporally landscape change in urban areas in the UK. A variety of topics are introduced initially and developed on a chapter-by-chapter basis by the authors. Part I is written by the first-listed author from an applied geomorphology perspective, and Part II is written by the second-listed author as a historical archaeologist. The former author has been working on Oxford studies since 2002 (and published since 2004) and the latter author began an examination of urban British churchyards predominantly towards the East Coast since 2007. Each author brings a different disciplinary perspective to this eBook; it is hoped that this will benefit an integrated presentation of physical and cultural landscapes that encompasses traditional geomorphology, as well as more applied geomorphology that encompasses ‘archaeogeomorphology’ within an environmental geomorphology framework, with inputs from historical archaeology and landscape studies. The authors confirm that this chapter contents have no conflict of interest.